We have just been in a phone call with Timothy Mudd from Scredible, who have just launched their social news platform in the form of Android and iOS apps to the public today. It already existed in the form of the website, letting you collate data. Ever feel like the internet is full of too much information? This app is designed to cut through the rubbish, and bring you the kind of information you really want. What’s more, it has a built in machine learning AI mechanism, which means it learns more and more about you as you use it, making the results more tuned to your needs and focus. DUBLIN – 14 May, 2015 – Scredible plc, a developer of socially driven education technologies, is pleased to announce the launch of the mobile version of its education and knowledge-building platform, Scredible; now approved and available for iOS and Android devices. Scredible is the answer to an increasingly cluttered digital landscape, offering a one-stop platform for users to learn, know, and grow their presence and impact online. Over the past two years, Scredible plc has been breaking new ground by combining next-generation professional skills and talent development tools with advanced education technologies. The company’s sophisticated, AI-driven, contextual content and social context platform is designed to learn from a user’s engagement, from their likes and dislikes, and then identify gaps in knowledge for future use in programs designed to improve users’ learning efficiency and social experience. This process improves over time as a continuous and predictive feedback protocol intelligently adapts to changing goals as the AI ‘evolves’. 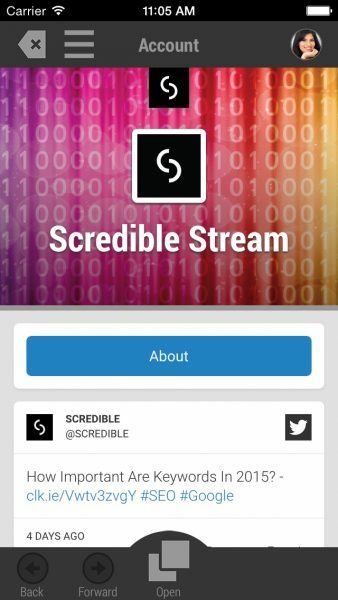 Simply put, the Scredible app is designed to provide a faster, smarter way for users to discover new content and trends, to understand what they need to know, and ultimately to predict what users should know next to achieve their goals. The machine learning technologies underpinning Scredible’s app evaluate the strength of news and other online content, applying systems that counteract the cookie-driven skew prevalent in many online searches. This enables the platform to assess whether the delivered content matches with individual user’s selected criteria by combining factors such as the quality of the source, the author, keywords, sentence structure, and context. The app has been designed to intelligently weed out the weak, underwritten, or ‘over-optimised’ articles that clutter most social feeds. Finds content: Scredible scours the web for real-time contextual information, content, and news – all while figuring out what you need and ignoring what you don’t. Helps you research and stay on top of important topics: Scredible allows you to navigate by topic, author, and publication to get a 360 degree view of any subject, building a clear view of trending and current topics, each vital for individual users’ to meet their goals. Gets to know you: Scredible learns from your goals and habits to source content that is both relevant and useful. The accumulated knowledge enables the platform to identify gaps, then source and present new, trending, and timely material in real time.. Helps you write: Scredible makes building social authority and followers easier. It scans content to provide ready to use posts, synopses, and comments that make sharing quality content easier. Helps you learn: Scredible lets you see how many likes, shares, hashtags, keywords, and clicks your posts have generated every day, week, month, and year, providing a clear view of areas for future focus. Colin Lucas-Mudd, CEO of Scredible plc, says: “A strong digital footprint is becoming ever more crucial for professional success in all sectors. But users are drowning in content, and every day the problem of separating the signal from the noise gets worse. 500 million tweets are posted every day on Twitter and 30 billion pieces of content are shared every month on Facebook. Irrespective of the breadth of any individual’s needs, it’s no longer possible to keep one’s finger on the pulse, nor to generate timely comments and posts, without the application of today’s advanced technologies. To find out more about Scredible, visit the website at https://scredible.com/ or download from the Apple App store or on Google Play.